Sweet Potato, Yams, Is there a Difference? Home DIY Natural Blog Food Sweet Potatoes and Yams, Is there a Difference? Sweet Potatoes and Yams, Is there a Difference? If you’ve ever heard that a sweet potato might address one health issue or another, you know that the internet is a confusing place to look for more information. It seems that everyone from popular health experts to your local grocer has a difficult time keeping the yam and the sweet potato separate. In fact, these plants are very different. Sweet potatoes have the scientific name of Ipomoea batatas and are in the morning glory family which originated in South America. If you’ve ever grown a row of sweet potatoes you’ll recognize the similarities between the two vines. You plant “starts,” or small roots of the plant, in the spring. Each individual specimen will develop multiple swollen underground roots which are then dug just before the first frost in the fall. The sweet potato is able to complete its growth cycle in our short growing season here in the United States. For that reason, if it is local, it isn’t a yam regardless of what someone is calling it. In fact, most tubers in the US that are labeled “yams” are actually sweet potatoes. Sweet potatoes come in a variety of colors, textures, and levels of sweetness. The flesh can be white, orange, or purple. On our farm we have grown Jewels, Centennials, and Beauregards and loved them all. There are many other types and the popularity of any one variety depends on where you live. Sweet potatoes are very nutritious, being high in beta-carotene, flavonoids, vitamins, minerals, and antioxidants. They aren’t, however, the plant that is used for hormonal support. Why do we call some sweet potatoes yams? In some parts of our country “yam” is a slang word for the sweet potato. This preference may have stemmed from a move that was made in commerce when southern producers wanted to make a distinction between their sweet potatoes and the more well-known varieties of the day. The word “yam” actually became trademarked in association with southern sweet potato varieties that were orange, soft, and sweet. The true yam is in the dioscorea family which originated in Africa. There are many relatives of the yam growing all around the world, including some native varieties here in the United States. Most notable among them is the wild yam (Dioscorea villosa) which I have used personally to support a healthy liver and balanced progesterone level. The dioscorea family is responsible for the steroidal saponin, diosgenin, which has been synthesized the world over to make birth control pills, topical progesterone creams, and menopausal therapies. While growing, true yams look more like plants in the lily family having grass-like leaves. Some of the family members vine, but all produce tubers of various size, shape, and color. The skin often has a more bark-like texture than the sweet potato. As more people move toward eating their medicine or adopting more natural therapies for their imbalances, this is a great illustration of why we need to be specific about our terminology. Sweet potato and yam are common names. If I were to use a sweet potato diet (thinking they were yams) to correct my infertility diagnosis I would be frustrated, to say the least. With plants, it is important to be certain of the scientific names when studying, growing, or eating them. In this case, the confusion is highly unlikely to be dangerous, but that isn’t always the story. 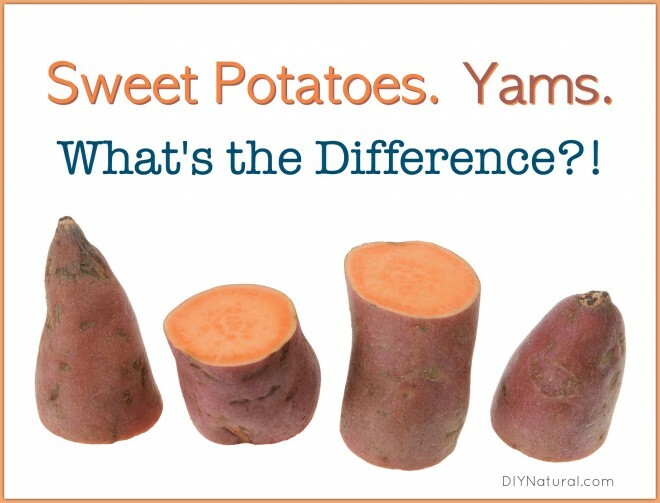 Have you ever been confused about the difference between sweet potatoes and yams? What did you think the differences were? I’ve been looking to purchase yams for their healthful benefits, but can never find them. Any suggestions on where I can buy them. I live on Long Island NY. Sorry, no I don’t really have any tips on where to find it to eat. It seems to me I found it here in Ohio in the grocery store years ago when I was struggling with fertility issues. You’d have to keep reading the sides of cans to make sure of the species of course, but I believe I got lucky once or twice. You could always ask your grocer if they can stock it. Yams are a component in progesterone creams? Do you know of any brand of progesterone cream that incorporates yams or do you have a recipe for such a cream. My Dr put me on a progesterone cream for hair loss due to menopause, but has since moved away and I’m unable to get the prescription renewed. I’d love to find a product that would slow or stop the hair loss. I don’t, but you could make your own or simply use a tea. Check out wild yam at mountain rose herbs.com.